Ever have a weekend so great you find yourself doing this? Just kidding. I don't have that hat. But I did have a great weekend. Many of you already know that I'm the Manager of Online Communications for the animal advocacy group In Defense of Animals. This weekend, we launched our first Virtual Demo for the International Day of Action for Elephants in Zoos, and it was a huge success. I mean, I'm still amazed. People all over the world participated, changing their profile photos, posting comments, and tweeting at zoos - letting the zoos, their fans, followers, friends, and the whole online world know that wild animals don't belong behind bars. Over the weekend, more than 7,000 online actions were taken, 500 new people were introduced to our organization, and almost 200 people changed their profile photos to the day of action "sign". As someone who spends all day, every day online advocating for animals, this is the best day I've had in long time! I'm already looking forward to our next one. But it didn't end there. Just when I thought the weekend couldn't get any better - Sunday morning we had these quick, easy and delicious "pancakes" for breakfast and I got to play a video game with my best friend. In a 9 inch glass pie dish/pan, melt the Margarine. Once melted, brush the melted Margarine up in the wall of the dish and completely cover the dish. In a bowl, mix Apple Sauce, Ener-G Egg Replacer, Flour, Soy Milk and Salt with a wire whisk until thoroughly mixed. Pour Pancake mix into the pie dish with the melted Margarine. Bake for 20 minutes, or until puffy and a deep golden brown. 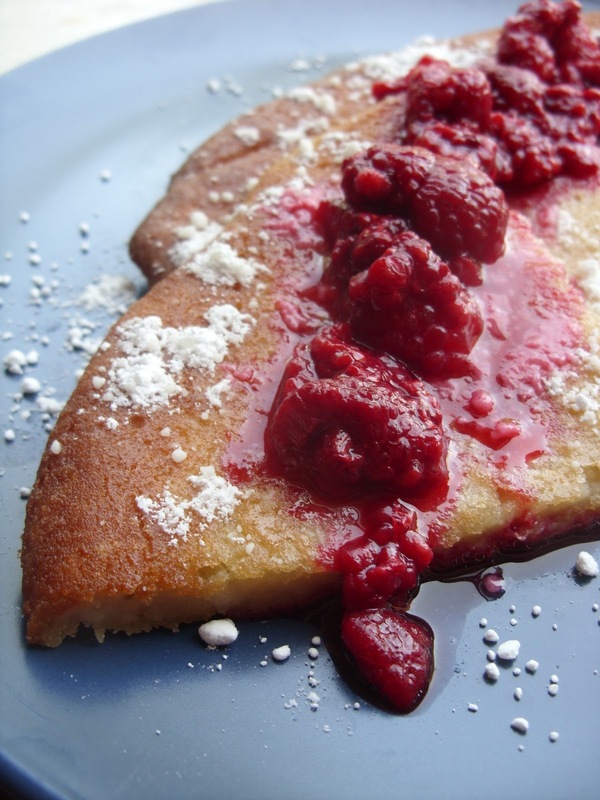 Flip the Pancake once in the pan to get melted Margarine on both sides and serve with Powdered Sugar and Berries. This goes great with a huge soy mocha and some video games with the love of your life. I AM MESMERIZED BY THE SPACE GIRL DANCE!!!!! ....and the pancakes. looks so yummy! can you substitute, almond, hemp, or coconut milk instead?